Promised much...delivered very little. I was looking for an informed incisive analysis of Trump; I only saw chronological snippets that the media so thoroughly reported on. It was lengthy but enjoyable. 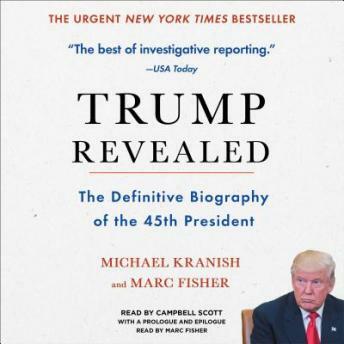 The story incorporates snippets from the life of his grandparents, parents, siblings and Donald's academic years and his growth in the property market. If this is the real Donald Trump, OH BOY, is America ready? No point telling this man to "grow a pair". He would put a rutting bull to shame. I have no doubt he has NPD: no empathy, self absorbed, lier, will do whatever he has to do to boast his own self importance, even phone the media under a pseudonym of Mr Barron, to boost publicity. "Barron" now being his last son's name. Yet, I admire him for his audacity, staying power and being a spectacular marketeer. Everybody knows the Trump brand, one of the most recognized brands in the world! You don't achieve this by playing "nice". I often found myself rewinding to make sure I heard correct. His wheeling and dealing is beyond words. How did he last? This comes from the Washington Compost and the Boston Blow. JUST SAY NO.